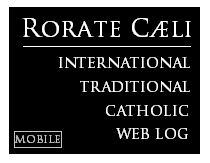 We at Rorate really try to avoid debating other websites. This is not because we feel "superior," but for more prosaic reasons: this is a free website, and we simply make no money off more visitors, whom we wish only to inform and uplift; and we despise the inward-looking view of those who waste their time with...other news sources, instead of the content itself. One must strive to generate more light than heat. Curiously enough, that seems exactly the point made by Bishop Athanasius Schneider in his "clarifications" sent to Mr. Michael Voris, who had asked him about his comments to our partners of Adelante la Fe/Rorate Caeli en Español. Incredibly and amazingly, it seems the clarifications did not clarify anything to Mr. Voris, and they did not include one single mention of the word "schism," or indeed of the very concept of "schism." "Schism" seems to be far away from the concerns of Bishop Schneider in his view of the SSPX. Nothing in his "clarifications" retracts or takes away from anything he said to our Spanish-language partners. 1. I have not said that there are no reasons which would hinder a canonical recognition of the SSPX, but I said more cautiously "To my knowledge there are no weighty reasons". 2. I have not said that the current canonical situation of the SSPX is OK. The contrary, because of the their uncanonical status it is necessary that they receive the recognition from the Holy See. 3. I said that the SSPX should be received as they are, meanwhile. My thought is this: for pedagogical and pastoral reasons they should be meanwhile accepted as they are, in order to correct by time those things which have to be corrected in the SSPX. 4. 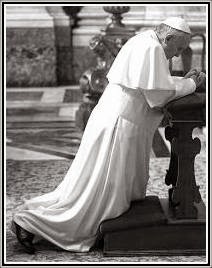 I never said, that I support the positions of the SSPX about Vatican II. I only said, that there is on both sides, i.e. the Holy See and the SPPX an over-evaluation and overestimation of Vatican II, yet on opposing points of views. The question is the right measure, i.e. we must have an estimation and a good evaluation of Vatican II, but not in an exaggerated manner. We have not to make Vatican II a Council isolated from all the previous Councils or a kind of super-Council. 5. This is the tragedy of the history, that in confused times as this is our time, the good forces in the Church, which want to restore the true faith and Divine worship often fight one against the other, to the detriment of the true renewal and to the joy of the enemies outside and inside the Church. 6. Of course, the SPPX has to make their critics with more respect towards the supreme authority of the Church and has to avoid incorrect and exaggerated expressions and judgements. One has to act with the principle "veritatem facientes in caritate" (to defend the truth with love). This I often told to the representatives of the SSPX. 8. Each true catholic should only be glad and thank God, when the SSPX with all their priests and Catholic families, from which the majority are faithful Catholics, would be recognized by the Holy See, so that there would be a new considerable force for a renewal of the Church according to the mind of the Saints, of our forefathers and of the true intention of Pope John XXIII, the intention which is demonstrated in his speeches and especially in the document drafts (schemata) which this Pope ordered to prepare and which he personally approved. 9. The current situation of the Church is similar to that of the Arian Crisis in the 4th century: there is a naval battle in the night, where the enemies of the Church attack vehemently the big ship of the Church, whereas in the same time little ships of several true Catholic groups attacks one another, instead of make a common defense against the enemies.